With Valentine’s Day being all about love and sharing our hearts, I thought what better way to show your love than to do it though food. Citrus is one of the best fruits for our heart health. It’s full of flavonoids, an antioxidant found in fruits and vegetables, that has been found to protect against heart disease. High in vitamin C and a good source of folate, citrus fruits also are known to enhance the absorption of iron in food. 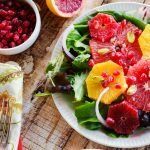 With it being the middle of winter it may seem like it’s slim pickings in the grocery produce department but this is the time of year for the most flavorful citrus. While you may reach for the traditional orange there are so many wonderful varieties of citrus to choose from, including ruby red grapefruit, blood oranges, navel and cara cara oranges, clementines, tangelos…you get the picture! 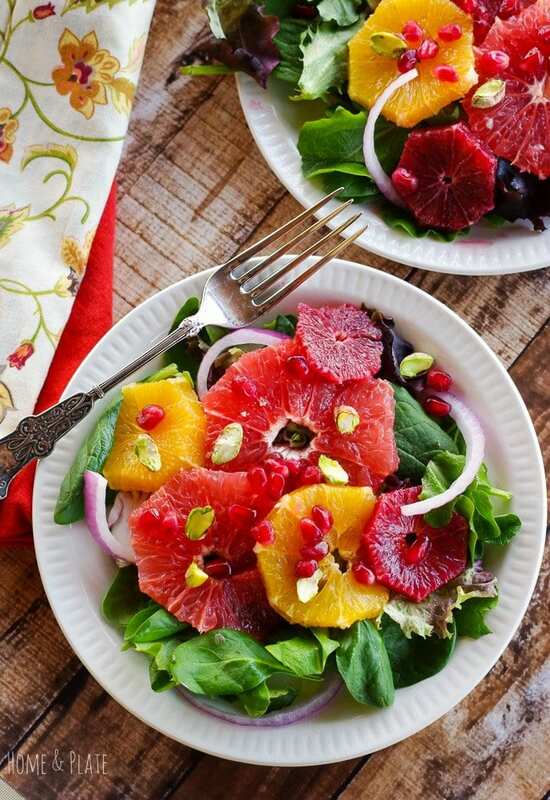 For this recipe I chose to pair sweet citrus on a bed of greens with pistachios and pomegranate seeds. A drizzle of honey champagne vinaigrette adds the finishing touches to this winter sweet citrus salad. The sweet and salty flavor combination is outstanding. The perfect way to get out of the winter doldrums. Be sure to try my Blood Orange Parfaits with Dark Chocolate Chips & Pomegranate Arils or my Ruby Red Grapefruit Honey Glazed Skillet Chicken. Celebrate Valentine's Day with a colorful arrangement of citrus on a bed of greens. 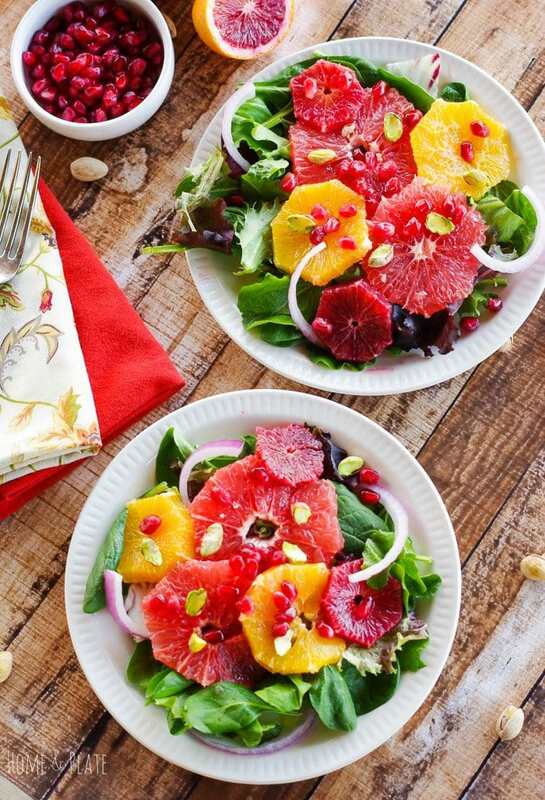 Serve this Winter Sweet Citrus Salad with Pomegranate & Pistachios. Peel the citrus being sure to cut away the bitter white pith. Using a serrated knife, slice the citrus into thin rounds. 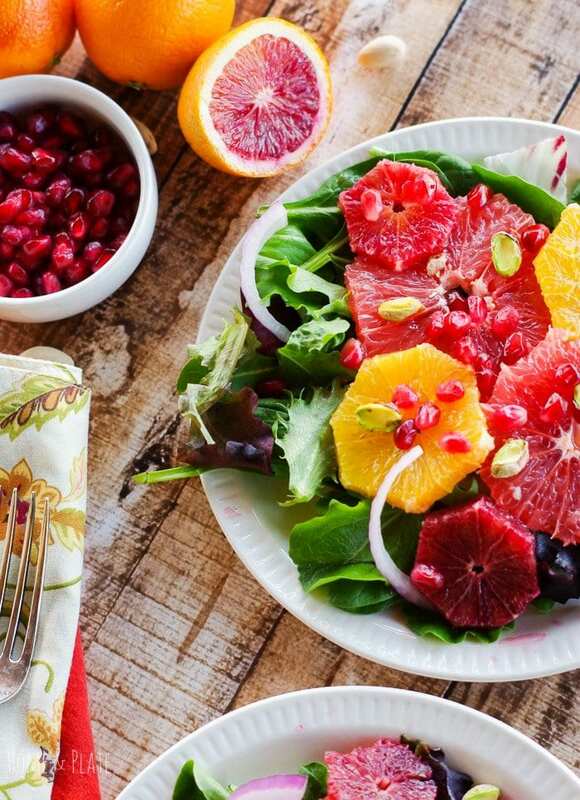 Arrange two plates with mixed greens placing the citrus and red onion on top. Sprinkle with pistachios and pomegranate arils. Drizzle the salad with the dressing and serve. I love how you underlined pomegranate’s texture and flavor here! Thanks Claudia…this salad was so delish. I hope you enjoy it! Thanks so much Brianne…it was a fun salad and tasted amazing. I will be enjoying citrus season and making this often. I really need to eat more fruit. This salad is so pretty and is a good reminder to me about different ways to get my fruit. Thanks Peter. This is the perfect way to eat your fruit. The colors on this salad look AMAZING!! I’m just drooling looking at all that citrus. I love pomegranate in my salad also. Ugh this looks so good I just want to reach through the screen and grab it! I wish that was possible because I’d serve it up if it were that easy. Thanks for the sweet words. This salad was so fun to make and so tasty too. FIrst of all, this sounds absolutely delicious in this dreary winter tundra I find myself in. Second of all, your photography is GORGEOUS! Keep it up! Thank you Taylor for this sweet compliment. I’ve learned through trial and error and learning along the way. I appreciate your words. 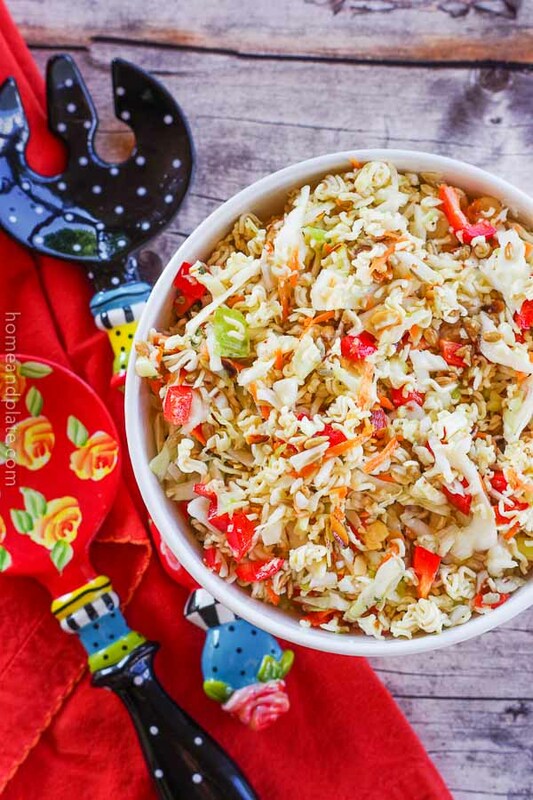 Thanks Mary…this salad is the perfect way to enjoy all the fresh fruits of winter. 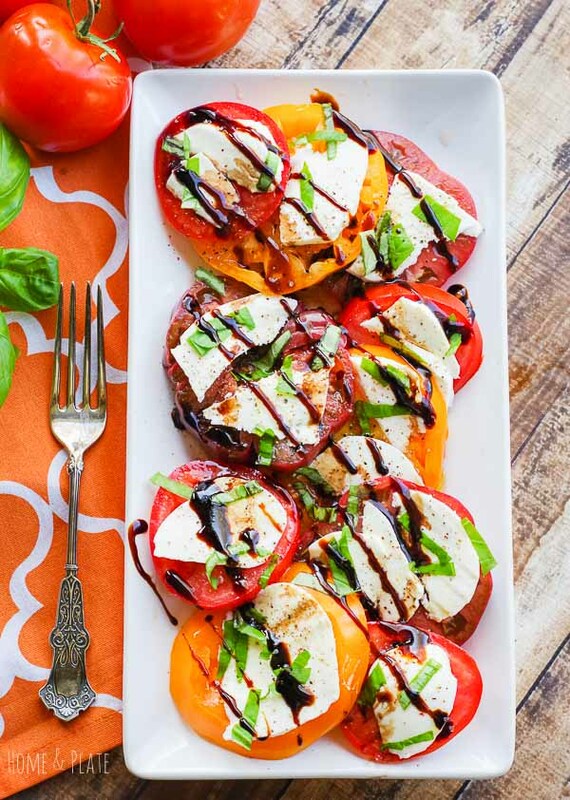 You actually kind of forget you are eating healthy with this salad. I hope you like it Khadija…the ruby red grapefruit is so sweet you should give it a try. It is also just as delicious without it. WOW! it literally made my mouth water as I read through this and the recipe – the citrus, the white wine vinegar, the crunchy onions – i can taste it all! I want to make of my own now! Manju, we gobbled down these salads. The flavors worked so well together and were a big hit at the kitchen table. You should give it a try.